Devastation | Create. Grow. Encourage. Heal. The second page of the journal. This describes how I felt and my reaction at the news my sister was brain-dead. 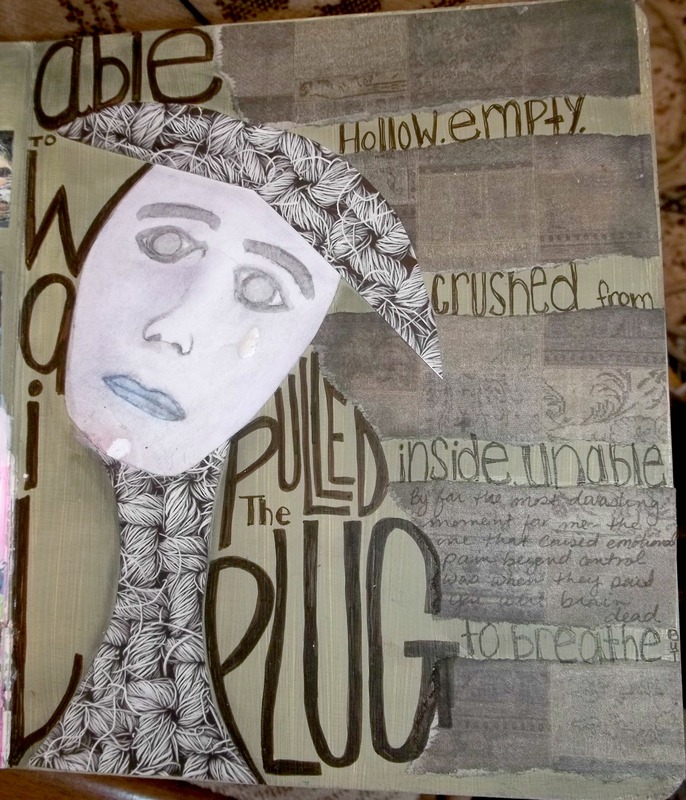 Each element is specific the knotted neck and hat/brain; the empty eyes and bleak face; the lack of color and presence of words are all purposeful. Although when I read it now – it only barely touches on the actual feelings of that moment. Think of a moment which devastated you – represent it on a page. Use color or words or scribble. It doesn’t have to make sense it just needs to convey that one moment of devastation. Acrylic The background was prepared at the same time as the previous page (see above). Watercolor The face was prepared on separate paper using Winsor & Newton watercolor and Derwent watercolor pencils. It was cut and collaged to the paged. Collage Torn paper on the side was a newsprint photo of a rug. The other images are patterns from a fashion book. Pen The lettering was completed with Letraset Promarker and Sakura Micron pens. Pastel Pan pastels were applied sparingly to the images neck and face. It must of been a very healing experience for you to express your feelings in this art piece. Art is always healing. It’s funny – I learned that by accident. But, I have seen it work over and over again. I love art and all art does and stands for. Thank you for your sympathies.